To be appointed as a school teacher in India, a diploma or graduation in education is a must. This ensures some familiarity with pedagogy. Contrast this to faculty candidates at higher levels, who are selected based mainly on content knowledge. Consequently, knowledge and/or experience of teaching methodology is either limited or entirely absent. Throughout my professional career as an educator, I have consistently sought to think not only about what is being taught, but also how it is taught. Determined to do more than criticise the system, I chose to become a consultant to teaching faculty. In this capacity, I work with teachers, either individually or in groups. At other times, my services are hired by an entire school/department/institute. Whatever the situation, the process requires me to gather background information and customise my advice based on that; it also matters whether the advice is sought for short- or long-term. I work with teachers to identify lacunae, we mutually agree on goals as I guide them towards solutions. Though there are a few concepts common to most cases, I consider each person/situation uniquely. I outline below some of the avenues available for professional growth of undergraduate faculty in India, and share my advice as a freelance consultant. What does Professional Development involve? Broadly, professional development includes tracking and documenting of skills, knowledge and experience that teachers gain beyond any initial training (formally and informally). In addition to ‘learning on the job’, it is both necessary and possible to seek expert help in teaching well. The experts may be more experienced and/or effective colleagues, content specialists or advisors in pedagogy. The National Curriculum Framework of Teacher Education (NCFTE, 2009) states a number of aims of ‘Continued Professional Development’ for Indian teachers. They range from ‘exploring, reflecting and developing one’s own practice’ to ‘researching and reflecting on learners and their education’, and ‘breaking out of intellectual isolation and sharing experiences and insights with others in the field, both teachers and academics working in the area of specific disciplines as well as intellectuals in the immediate and wider society’. Everyone is familiar with the orientation programmes for new faculty offered by academic staff colleges; but these are mainly catered to university faculty. A main drawback of these programmes is that they are too generic and therefore vague. Funding agencies like the UGC and DBT or faculty associations at various levels also organise workshops for faculty. The options I have listed here are of more customisable nature, catering to needs of individual faculty or college/institute. 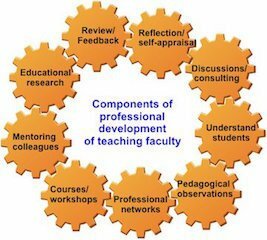 Professional development for college faculty: ‘why’ and ‘how’ to do it? Usually, only schools are monitored by Education departments. We do not hear of inspectors visiting college classrooms to assess activities and progress. I am not advocating the need for such supervision but an internal, self-motivated system of feedback set up by the faculty for themselves would go a long way in improving teaching practices in colleges. Reflecting on one’s own teaching practices, maintaining a journal of self-appraisal, is the simplest yet most effective mode of professional development. To aid in this self-analysis, one’s apprehensions as well as achievements as teachers can be discussed with students, seniors and colleagues resulting in instant feedback. Subscribing to and reflecting on the content of relevant magazines and blogs can also be very useful. Examples include articles in journals as Active Learning in Higher Education, Journal of research in science teaching. Online platforms like the national knowledge network and Google groups such as ‘Teach in India’, can be utilised to carry out discussions with like-minded faculty. These forums provide opportunities to discuss with colleagues, contributing articles to these sources can greatly help faculty in their professional growth as teachers. Interested faculty can also sign-up for online courses offered by EdX and Edutopia, for instance, often allowing the learners to proceed at their own pace. The benefits would multiply if several members of the faculty register for the courses together and gain from discussing the content and performing the activities together. > In a course on organismal biology, focusing mainly on ecology and evolution, the students were asked to write one of their assignments as a journalistic report. In consultation with science writers and non-biologists, I prepared a marking chart considering weightage to be given to various aspects of the report like the title, content, style etc. In one batch, unexpectedly, a student decided to add a very relevant photograph to the report, which really enhanced the assignment. This led me to rethink my chart – I had to add a column for images. So, in addition to taking the help of experts in other fields, work of a student also enabled me to plan the evaluation/feedback better. > As a resource person, I met Biology faculty from different universities at a workshop on laboratory techniques of conducting experiments with fruit-flies. In the four-day workshop, some of the participants who worked with fruit-flies for the first time, realised how simple and low-maintenance the flies were. This experience assured them of being able to grow stocks of flies in their respective laboratories and several of them discussed clear contexts and lab sessions they planned for their students using different aspects of flies at various stages of their life cycle. Presenting the ideas to their peers from other places provided them with insightful advice which helped to make the plans more practical and effective. As an undergraduate faculty, if you would like to discuss options for your own professional development, I would be very interested to hear from you.